This weeks diva challenge was......well.....challenging for me. I have seen zendalas before and admired the work and control that goes into them - but, as control is a hard thing for me I think this will probably be my one and only. I need the backup of being able to create a scroll or something else if one of my lines goes skewiff - and believe me - many, many of my lines have a tendancy to do just that - it is as if my hand has a mind of its own, there I am with a plan, pen ready to go, and my hand will not co-operate. What is that? So, the challenge. 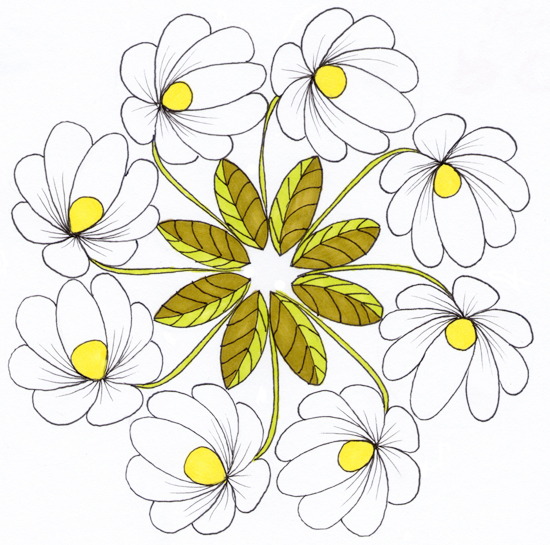 I LOVE flowers, and a lot of my drawings are of flowers, so I wanted to draw....yep, you guessed it.....flowers! It took an intense staring showdown between me and the zendala string for the daisies to give it up, but they eventually revealed themselves - the result is a pretty simple and easy pattern. The bonus was that I got to colour it with some of the new promarker colours that I got last week. This probably could've done with a little shading at the base of the petals, but I wanted the petals to be very white, so left it. I hope this isn't the only Zendala you do! I love it--so sweet and fresh, really, really pretty! 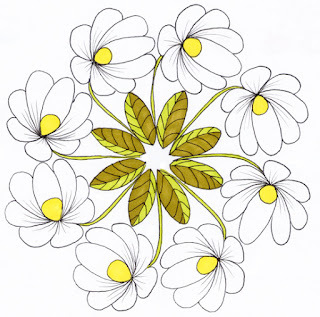 I love daisies and this is just so fun. Beautiful job! Delightful! I echo the comments above. Well done! Amazing! Simple! delicate! special! creative! Well done! Fantastic interpretation of the challenge and so skillfully rendered! So creative! I love flowers also and your zendala is just wonderful. Your daisies are so bright and refreshing. This refreshingly beautiful; and your flowers are wonderful. I hope you will give zendalas more than one chance; they are so much fun. Now THIS is done by a very artistically creative mind! It's the most creative I've seen in this challenge. Very nicely done. Way to whip your template into submission. Beautiful and sweet. I so relate to your Zendala phobia but this is wonderful!